We have been working recently with some of our long-term clients to expand their online advertising from PPC into PPC + online display. For some reason, it seems to be something that quite a lot of prospects have been more interested in recently when I have been out and about meeting people. I can only speculate that this is because of the increased visibility of online advertising as all the media talks about online as resistant to the downturn. The combination of search and display is something that fascinates me - I have written about trying to measure it before over at SEOmoz. 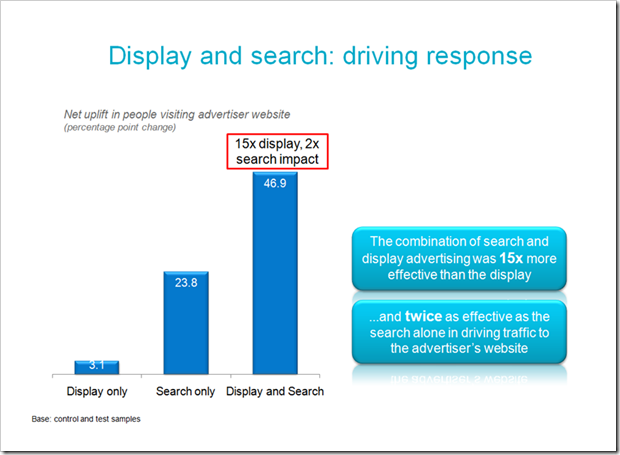 So I was interested to read Nick Drew's piece on research Microsoft have done with comScore to measure the uplift in traffic to a site when display advertising was combined with search. The results are pretty dramatic as you can see in the chart above (hope they don't mind me nicking the chart - I'm assuming they want to spread the word far and wide!). The comments on that post are worth reading because there is a bit more insight into the methodology. While it is never possible to guarantee results in this kind of study without doing extensive double blind work advertising new brands that do nothing else, it is nonetheless interesting data. The biggest question it creates in my mind is about the mechanics of the effect and the relationship with natural search. Presumably most of the search traffic that display advertising drives is branded queries - and most brands rank for their brands, so the mechanic of why PPC is causing such a large uplift when combined with display is still not entirely clear to me. Anyone got any ideas about that?